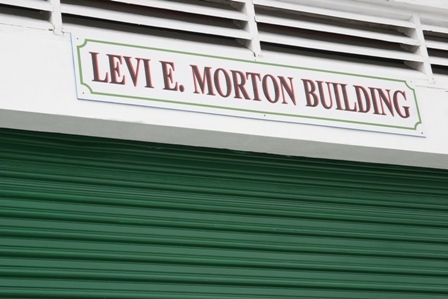 CHARLESTOWN NEVIS (May 27, 2010) — The Nevis Supply Office at the Pinneys Industrial Site was officially renamed the Levi E. Morton Building on Wednesday, a posthumous honour in the memory of Mr. Levi E. Morton, a former Trade Minister who served in the Nevis Island Administration from 1983-87. The new name was unveiled by Premier of Nevis Hon. Joseph Parry and Mrs. Morton. 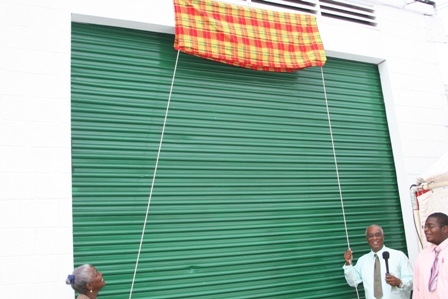 The renaming ceremony was the fourth facility to be renamed through the Ministry of Social Development, since an announcement on National Heroes Day 2009, that six public buildings and places would be named after seven local heroes, who had made significant contribution to the development of Nevis. In an address to mark the occasion, Minister for Social Development Hon. Hensley Daniel said the work of Mr. Morton must be permanently etched in the memory of Nevisians who they owed a debt of gratitude, more so and apology on account of the family connections he had lost due to his political career. Mr. Daniel said Mr. Morton had demonstrated a noble kind of patriotism and armed with eloquence, a razor sharp intellect, good command of language and a high level of confidence, he set out to work with the Nevis Reformation Party, to develop programmes and projects which rebounded to the benefit of the people of Nevis. “Mr. Moron got into politics because as Robert Oppenheimer would say, it was an organic necessity. As a good old sheriff, he never dies, he has only faded away. Mr. Morton did not ask what he could do for Nevis [but] he set about doing something good for Nevis,” he said. According to Mr. Daniel, money had become the preoccupation of many politicians today, unlike Mr. Morton. “I am aware that Mr. Morton is not regarded as a successful politician because he did not spend his time amassing wealth and grabbing property. He served his country with distinction and was heavily involved in shaping the new Nevis. “He was one of the first five men elected to the Nevis Island Assembly in 1993. He served as a Junior Trade Minister without even getting a full salary. What commitment! What service! What a giant of a man!” he said. 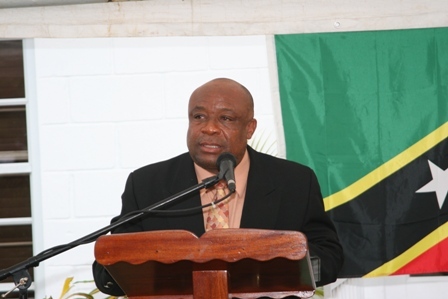 The Social Development Minister said Mr. Morton remained awake through the period of social change in the 1970s, so that he could adjust to new ideas, remain vigilant and face the challenge of change. He said being an opposition politician in Nevis from 1979-80 could not have been a comfortable experience for Mr. Morton. Mr. Daniel contended that the History books he read never recorded the work of Mr. Morton but in an effort for today’s generation to remember his selfless contribution to the development of Nevis the symbolic name change was the NIA’s mission to recast the society in the image of local persons like Mr. Morton, who had contributed so much to the development of a modern Nevis. “Without ceremonies like these we will see ominous clouds of inferiority among our local people. To the young this ceremony is significant…a hero is not a hero until he is recognised as one… Heroes are not just reflections of what has already happened but are also harbingers of what is to come. “This ceremony says thank you, thank you. We appreciate and treasure your contribution to the development of the country,” he said.